They came. They saw. They mocked. The self proclaimed longest-running live comedy show in the world returns to Edinburgh and with a variety of subjects from the aftermath of the General Election to Greece’s debt woes, it would seem that no topic or celebrity is left unturned or untouched. As a show, it can count Bill Bailey and Alistair McGowan among it’s alumni and you see shades of these mighty comedians in the current crop of Kieran Mortell, Katriona Perrett, Simon Prag and Naomi Bullock (whose interpretation of Nigel Farage is worryingly close to the real thing). Mortell exudes a manic energy while Bullock’s facial expressions are hilarious and deserve a Fringe show all of their own. Simon Prag’s on- the-nose impression of Nicola Sturgeon is the undisputed highlight of the evening – so much so, you can only suspect the First Minister herself would approve. NewsRevue’s script brings hilarity to the last 12 months and while some of the stand out jokes are laugh out loud funny, a portion of the material veers to the obvious. Also, material is made from easy targets (Haven’t we seen enough royal family sketches?) and the London-centric gags struggle to land as they deserve to. Probably because it’s in Edinburgh, two skits – one about Andy Murray and one about the weather – prove wildly popular. There is an argument that NewsRevue may be the Fringe’s best kept secret. While it may not be the best or cleverest satire you’ll find, it’s an amusing way to spend an hour of your Fringe time. Vote with your feet, dear reader, and buy your ticket quickly. 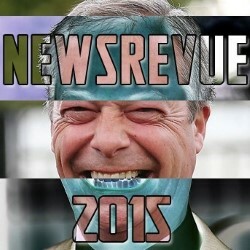 NewsRevue is at the Pleasance Courtyard (Beyond) at 6.30pm (1hr) until 30th August (not 18th).